Star Wars: Knights of the Old Republic has been around for roughly fifteen months and in that time the game has gone from strength to… well, free to play. While some might say the game has struggled in its first year of operation, this has not stopped the team at BioWare working on producing an expansion pack, and on April 14th, Rise of the Hutt Cartel will launch. The expansion documents the Cartel’s rise to power and the threat they pose to both the Galactic Republic and the Sith Empire. This completely voiced expansion will open up a new world for players – the war torn Makeb, where players will battle against the upstart cartel. 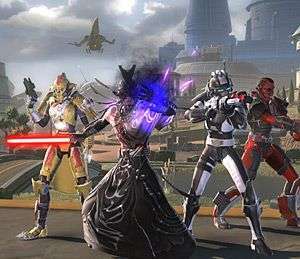 In addition, BioWare have raised the level cap from fifty to fifty five, with each class gaining a new ability, like the Jedi Sentinel double lightsaber throw. Players will also gain access to a new level fifty five operation – Scum and Villany. Forming an elite squad, Republic and Sith troops alike will be sent to the planet Darvannis to stop the Hutt Cartel raising an army there. This new operation ups the ante, with seven bosses, the most seen in any operation so far and boasts a new set of loot items for those more mercenary players. Interestingly, BioWare have also chosen this expansion to include same-gender relationship dialogue. While it is a positive step, players can only access this for a low, low price of £10 for non-subscribers and £5 for those who also fork out roughly £8.99 a month to play. Players who pre-ordered before the 7th of January will get access to it from the 9th of April, whereas those who missed out will have to wait until the 19th to begin this new episode of the Star Wars saga. Prepare to drop your cash shipments at the first sign of an Imperial cruiser within the next few days.